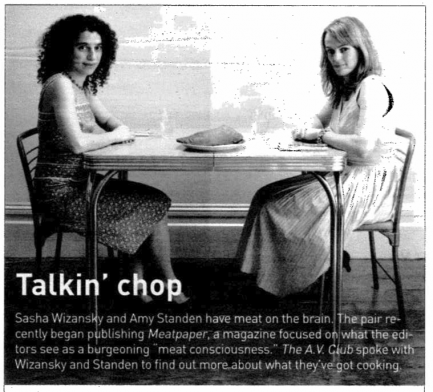 Sasha Wizansky and Amy Standen have meat on the brain. The pair recently began publishing Meatpaper, a magazine focused on that the editors see as a burgeoning “meat consciousness.” The A.V. Club spoke with Wizansky and Standen to find out more about what they’ve got cooking. ← The A.V. Club: Start Your Wining! This is a carbon-neutral website. Text and images © Ray Aguilera, 2009-2013, unless otherwise noted. Don't steal stuff. Contact me for licensing/usage rights.